For year 2013 the Mercedes Benz GLK350 4Matic has undergone quite a lot of changes compared to the previous model, on both the interior and the exterior. Roughly 1,000 parts have been replaced and redesigned, and beyond the notable changes in aesthetics the 2013 model also comes with a new engine, transmission and electromechanical steering. Under its hood the GLK350 comes with a direct injection 3.5 liter V6 unit able to develop 302 horsepower and 273 lb-ft of torque. The 3.5 liter unit has been mated with a new and more fuel-efficient 7-speed automatic gearbox. In case you're looking for an even more economical GLK, next year a GLK250 BlueTEC variant boasting a four-cylinder diesel engine is expected to be available in dealerships next year. 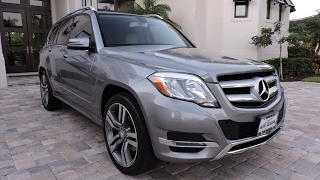 The GLK is known to offer a near-perfect combination between the agility of a sports sedan and the comfort of an SUV. This year's model will be no different and so will feature a Standard Agility Control and a four-wheel independent suspension system. Safety is another characteristic of a GLK and the 2013 model brings new safety features to the table including Attention Assist as a standard, and optional extras such as Distronic Plus featuring Pre-Safe Brake, Active Lane Keeping Assist, Active Parking Assist and Active Blind Spot Assist. As mentioned above, the new model comes with a new fascia and the most notable changes include a new front and rear bumpers, LED daytime running lights on the lower vents, a refreshed headlight design, a revised center grille, chrome exhaust tips, new taillights featuring fiber optic cables and LEDs, and a pair of new roof rails. Furthermore, the GLK350 can also be equipped with an optional AMG Styling Package that includes a body kit, aluminum roof rails, new LED daytime running lights and a new set of 20 inch alloy wheels. On the interior the new GLK350 is no stranger to upgrades either and from the very first glance you will notice a reworked dashboard with new circular vents, a color display in the instrument cluster and LED ambient lights. The only downside is that the driver's seat controls are still part manual, same as in the ongoing model. In case you're interested in the new Mercedes Benz GLK350 4Matic you'll be able to buy one from dealerships starting mid-August, with the 2.5 liter BlueTEC variant arriving a bit later during the first quarter of 2013. Price-wise there isn't much to say about the US variant, but in Europe the base model GLK350 is expected to cost 50,000 Euros, whereas the GLK250 will set you back 46,142 Euros. In case the GLK is not exactly your cup of tea, you can always turn your attention towards the BMW X3, Audi Q5 or the Infiniti EX35.